Source: CICH graphic created using data adapted from Statistics Canada, 2016 Census, Statistics Canada Catalogue no. 98-400-X2016189. https://www12.statcan.gc.ca/census-recensement/2016/dp-pd/dt-td/Rp-eng.cfm?TABID=2&LANG=E&APATH=3&DETAIL=0&DIM=0&FL=A&FREE=0&GC=0&GK=0&GRP=1&PID=112450&PRID=10&PTYPE=109445&S=0&SHOWALL=0&SUB=0&Temporal=2017&THEME=120&VID=0&VNAMEE=&VNAMEF= – accessed July 3, 2018. In 2016, 2.1% of all Canadian children under five years of age were born in another country. 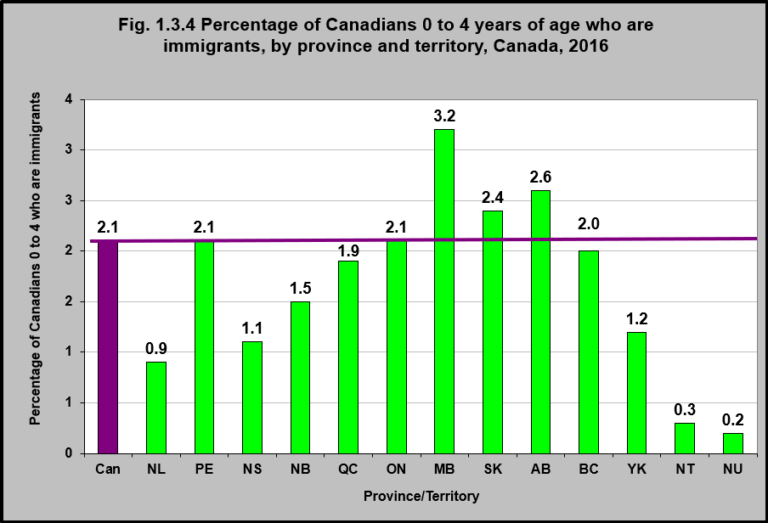 In Manitoba, 3.2% of all children under age 5 were immigrants. That was the case for 2.6% in Alberta and 2.4% in Saskatchewan. A large proportion of young Canadian children are immigrants – from diverse ethnic origins. This diversity adds richness to our Canadian society. However, these children and families may also face challenges in the form of discrimination which can have a significant impact on education, recreation and leisure as well as other domains of daily life.